I am so excited that this weekend the weather is finally cooling down here in Sunny South Florida which means its cardigan season. This Fall, my goal is to create staple pieces including cardigans that can be styled from preppy to edgy. This month's sewing plans was to create a few cardigans from different pattern companies for my November Fabric Mart blog post just in time for Thanksgiving. I am sharing my thoughts about each pattern and what I like and would change next time around. I wanted to use at least two commercial patterns, however, I did not select the right fabric choice for the Butterick I intended to use. I did NOT make any modifications to the patterns and plan to make a few the next time around. The Blackwood cardigan is an open front, fitted shape with extra-long sleeves. There are two variations available for this pattern: View A hits mid-thigh with hand-level patch pockets and View B ends at the hips without pockets. I opted to create View A without pockets for a chic look. The design lines are clean and chic. The bands (neck and lower) and sleeve cuffs add a special touch to the look. This pattern is very easy to sew, and any body type can rock it. The neckband requires 2 pieces instead of 4 as it is folded. Typically the Big 4 pattern companies requires 4 pieces which is stitched together and has a seam. The neckband is folded which gives it a classic look. The sleeves are very long for my personal taste so the next time around, I will remove at least 1- 1.5 inches from the length. I prefer cardigans that can cover my bust area so this style would not be my first pick as the design is more of an open look. Fabric choice is very important and a thinner lightweight fabric will not be as structured as a ponte knit. I originally planned to create the Blackwood using only the rib knit which is sold out but did not like the structure based on the look I was trying to achieve after I was done. I opted to create another one from a red designer ponte knit from my stash purchased from Fabric Mart. Fabric: Paprika-Poly-Lycra-4-Way-Stretch-Woven (Made last Fall). Fabric Mart has a beautiful suede scuba poly lycra here. M6884 is a cardigan with 4 views and two length options. I opted to create View B size small based on the reviews last Fall. The instructions called for interfacing the collar but if using a thicker knit such as a ponte, the interface is not needed. This style is very classic and simple and can be worn with or without a belt. Unfortunately, this pattern is no longer available on McCall's site and is out of print. The design lines are clean and simple, and the view variations can work for any body type. This cardigan can be worn with or without a belt. The sleeve length is perfect for my height and no adjustments were required. The neckband requires 4 pieces instead of 2 that is typically used with the Big 4 pattern companies. It also stated to be interfaced but this may not be necessary if working with a medium to heavy weight knit as it will make the collar stiff. After reading several reviews, the pattern does run big for a knit type cardigan so the size I cut was a SMALL. Fabric: Ponte knit available here. The Madison Cardigan drapes beautifully and has a high low feature. This cardigan with princess seam is surely not just your basic cardigan. The silhoutte and shape takes it from classic to edgy. If you are new to sewing and wanted to try out a great cardigan pattern, this is the pattern to start with. The princess seam in the back adds a special touch and the pattern has a tailored 2-piece sleeve. This pattern is very stylish and versatile and is not your everyday boxy cardigan pattern. The possibilities are endless when styling the Madison Cardigan because of the high low cut. There are no collar or neckbands to work with and Eryn has a sewalong to walk you through the process of sewing up this cardigan. I also love the fact that this cardigan style doesn't add too much attention to the hips and highlights my smaller waist! NOTHING! This is a winner in my eyes! The length is perfect and it definitely flatters by body type! 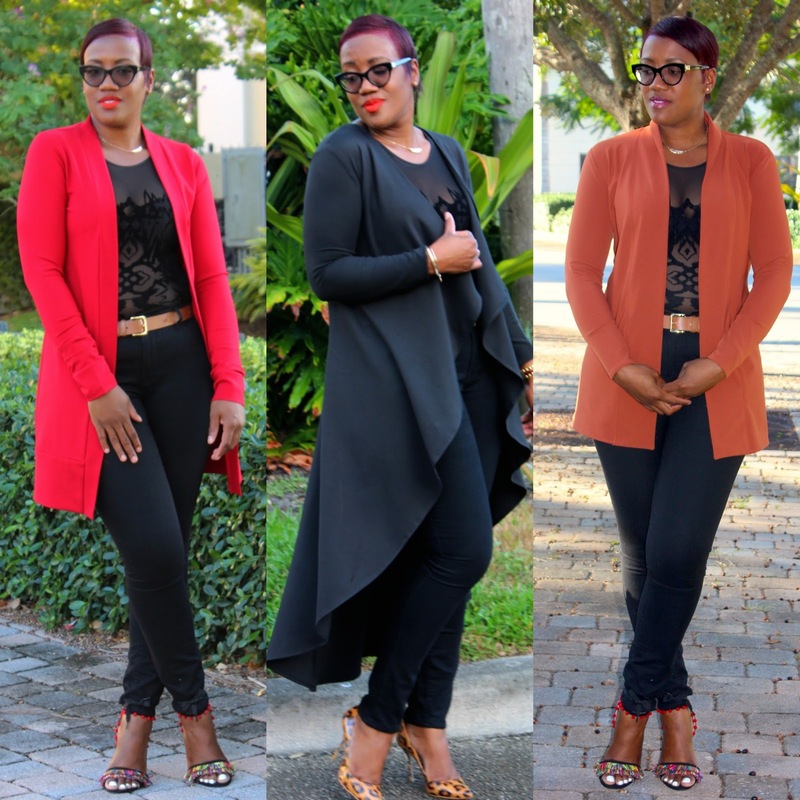 After working with a variety of fabric to make these cardigans, PONTE knit is definitely my first choice. Fabric Mart carries some of the BEST designer ponte knit and I always grab a few yards when they go on sale. I do plan to try a thicker sweater knit the next time around and give it a try with the Butterick pattern that I originally planned to make. Do you have a favorite cardigan pattern? Which cardigan is a winner in your eyes? Please leave your comment below and let me know which one you would rock! As always, thank you so much for reading and don't forget to stop by my Instagram page to check out my lastest make. Wishing you and your loved ones an enjoyable Thanksgiving break!! Thanks a lot.. The Madison pattern is NOT mine, it is an Indie pattern. Thanks a LOT!!! Yaayyy Glad you purchased it! You rock all of them! My favourite is the Madison because of the unusual lines. YES!! That is my favorite too!!! Thanks for the compliment! You did a lovely rundown of these patterns! I think you look great in ALL of them! wow. each one is really beautiful in its own way! terrific! Thanks!! YES they all are!! Thank you so much!! I do love the drape and the lines on this pattern. A WINNER for sure! Thanks so much.. The fabric with the colorful one is a LYCRA from Fabric mart. The Madison is versatile and works best with any knit fabric. YES!! I love it too! I love all of your cardigan looks! I do too, love The Madison the most. I have the printed pattern and have already made the style in 2 different fabrics. Ponte knit is for sure a good choice. I plan to make it again with a medium weight sweater knit. You look fabulous as always! I really love all 3 but the Madison is definitely a great cardigan pattern. Wow,they are all fabulous. I always love seeing your blogs.